D3 ... Technal has supplied systems for a façade area of 64,000 sq m.
Technal is an expert when it comes to providing customised solutions for facades and meeting design requirements of today’s complex architecture. 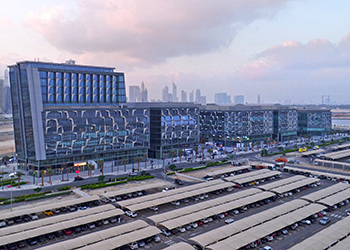 The façades and fenestration market in the Middle East continues to scale new heights of sophistication, where bespoke solutions are the order of the day. Technal, a market leader in propriety architectural aluminium systems, has risen to every challenge by creating customised solutions that meet the evolving architectural requirements of the region and respond to new trends. According to Technal Middle East’s (TME) marketing and business development manager Hesham Kameshki, the GCC’s façades and windows market has matured well in tandem with the demand for increasingly taller buildings that are architecturally more complex, inspired by the region’s showpiece Burj Khalifa, the tallest tower in the world. “With buildings getting taller and more sophisticated, there is a need for more advanced façade and fenestration solutions that provide enhanced design features and high performance, particularly in terms of thermal and acoustics properties, fire safety and security, and sustainability standards as laid down by Leed (Leadership in Energy and Environmental Design), Estidama (Abu Dhabi), QSAS (Qatar) and the latest Safat Green building rating systems (Dubai),” he says. Kameshki believes that the façade industry is now poised for a quantum leap in design, delivery and performance. “The need for adaptive skins that respond to weather conditions and structural requirements is greater than ever. Also, the impact of the low oil prices has put tremendous pressure on designers to look for global solutions with a local touch without compromising on quality and performance,” he adds. As a well-reputed aluminium systems provider that has been serving the GCC for more than 37 years, Technal has extensive experience and expertise backed by a comprehensive range of innovative products to meet every need of the region’s unique marketplace. It has, through its Bahrain-based regional office Technal Middle East, diversified its regional services over the past decade to keep pace with the trend towards ‘mega projects’ in the GCC that often call for special expertise in creating bespoke building envelopes. Many mega projects in the region show the hallmarks of TME’s superior engineering and design service capabilities. One such project is Dubai Design District (D3), featuring 11 buildings close to Business Bay in Dubai, UAE. 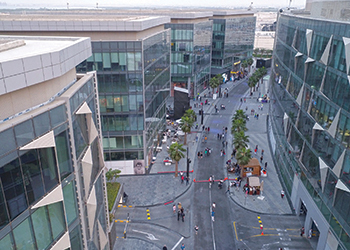 The purpose-built masterplanned development comprises residential, commercial, retail, and hospitality components and features distinctively designed public areas with unique street furniture and shaded walkways. Dedicated to the design community, D3 is expected to become a full-service commercial centre hosting several leading architectural design firms, and design industry-related organisations. TME was involved in the special façade design, which has intricate mashrabiya panels integrated with Technal’s Geode EL unitised bespoke façade. The company has supplied systems for a façade area of 64,000 sq m and modules of 11,900 panels. The façade works was completed in a record 12 months, says Kameshki. He attributes TME’s success on this project to its swift response in finding effective customised solutions for the façade that was engineered to meet the project’s architecture and design criteria, specifications and high performance standards, such as thermal, acoustic and seismic – all within the budget. TME was also swift with submittals and full mock-up sample delivery, in addition to providing a high standard of logistics services that ensured a short delivery schedule for the full range of Technal supplies for the whole project, including all internal treatments with high-performance doors and traditional stick façade. Other special projects where TME showcased its engineering expertise and Technal’s quality are The Address Sky Views Towers and Burj Vista Towers, both at the elite Downtown Dubai. Elsewhere in the region, Technal’s expertise in providing customised solutions can be seen at other recent landmarks in the UAE, Qatar and Saudi Arabia. These projects boast TME’s bespoke solutions featuring specially designed Geode ML and EL unitised façades, including high-performance concealed thermally-insulated hinged doors which are integrated intelligently into the façade through a technique that preserves the thermal and acoustic values of the main façade without impacting its architecture or aesthetics. Kameshki points out while specifications are getting increasingly stringent, Technal has always aimed to keep abreast of these requirements. “All our solutions and systems not only conform to the standards but even exceed them,” he says. D3 ... featuring 11 buildings. Like all businesses, the façade business in the Middle East has its own challenges, says Kameshki. One of these is mechanical constraints with increasing heights, such as resistance to wind pressure or seismic movements. As an example, the facade on Burj Khalifa must be able to resist up to 650 kg per sq m of wind pressure. Another challenge, he says, is fire safety and how to prevent the spread of fire from one floor to another through the facades. Another major issue related to high-rises, Kameshki says, is the cleaning of façades as this can only be done from the outside and, so far, there is no suitable solution to replace human manpower. Kameshki also anticipates the development of intelligent applications in façades that include managing and optimising user comfort according to weather and external conditions. Technal’s advanced bespoke solutions respond to the latest trends in architectural design, for example, minimalistic designs and slim visible structures. “This is particularly true for Technal’s sliding systems, such as Lumeal and Artyal that provide the maximum expanse of glass while keeping the profiles either hidden behind the wall or reduced to the bare minimum sightlines. 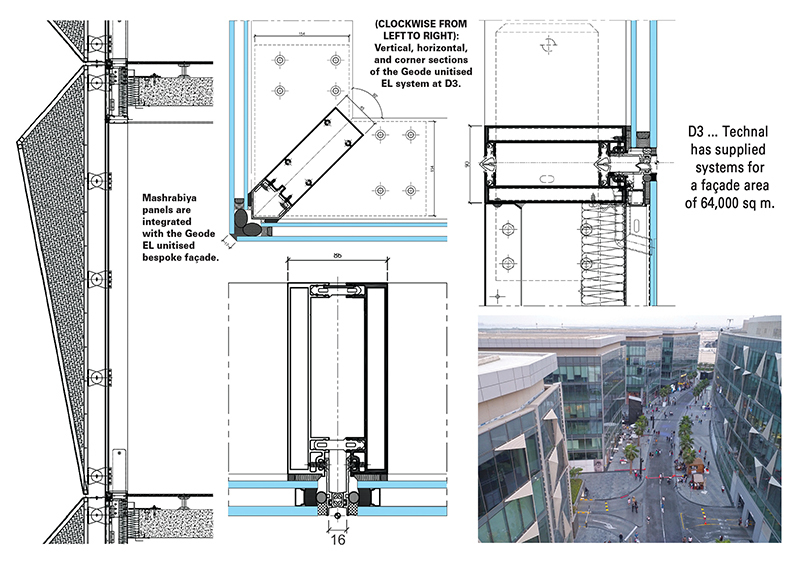 “Such design principles have also been applied to casement applications with the Lumeal Minimal featuring concealed opening sashes,” Kameshki says. Apart from aesthetics, Technal aims to address the gamut of functional requirements. Referring to the building industry’s concerns related to acoustic performance, Kameshki says the company’s research and development (R&D) department is working on new solutions and products that can significantly enhance the acoustic performance of building envelopes. These comprise passive solutions that focus on improving the design of aluminium systems, making them tighter and better able to manage vibrations, and incorporating new materials that have better acoustic properties. Technal is also working on ‘dynamic’ solutions, which analyse the external ambient sound and aim to neutralise most of the incoming sound, even when windows are slightly open. Among other innovations, Technal is developing simulation tools (Tec-Acoustic) that will provide the ability to evaluate the acoustic performance of a building envelope based on the aluminium system and infills used. Last but not least, Technal is also focusing on increasing the recyclable content of its systems. Kameshki points out while aluminium is a tremendous material from a recyclability point of view since only five per cent of the energy needed to produce it is required to recycle it, not many components used by the windows and façades industry are as friendly when it comes to recyclability. “Technal’s R&D department is working with industrial partners to find suitable materials that can replace these ‘non-recyclable’ material with more environment-friendly ones in a bid to provide doors, windows and facades that are 100 per cent recyclable in the near future,” he concludes.